Clyde, Dallas Dean Smith, 73, passed away on Friday, November 02, 2018 at his home. A lifelong resident of Haywood County and the son of the late Willie and Pawnee Hannah Smith. Dallas retired from Dayco after 33 years of service and later worked for Haywood County's Recycling Center. 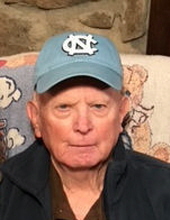 He was a lifelong cattle farmer and an avid Carolina basketball fan. He was a member of James Chapel Baptist Church where he served on various committees and taught Sunday-School for 30 years. Having just celebrated their 50th wedding anniversary, Dallas is survived by his beloved wife, Gladys Ann Haskett Smith; a daughter, Stephanie S. Parkins and her husband, Randy, of Clyde; a son, Jeffrey Smith and his wife, Wanda, of Smithfield, North Carolina; two sisters, Jeannette Snyder, of Lake Junaluska and Alline McMahan and her husband, Gerald, of Waynesville; two brothers, Jimmy Smith and his wife, Anna Lea, and Doyle Smith, of Clyde; five grandchildren, Cameron and Kelly Parkins, David and Keil Smith and Crystal Yeaman; three great-grandchildren, Zach, Jacob and Justin; and several nieces and nephews. Funeral services will be held at 3:00 p.m. on Sunday, November 4, 2018 in the Waynesville Chapel of Wells Funeral Home with Reverend Jeffery Moore, Reverend Billy Ferguson and Reverend Joe F. Haskett, Jr. officiating. Burial will follow at Garrett-Hillcrest Memorial Park. Serving as pallbearers will be Matthew Stephenson, Danny McElroy, Alan James, John Roten, Jason Leatherwood and Mike Haynes. Honorary pallbearers will be close friends and members of his Sunday-School class. The family will receive friends from 1:00 until 3:00 p.m. prior at the funeral home. Memorials may be made to Gideon International - Haywood West Camp, P.O. Box 634, Waynesville, NC 28786.